← This is the Grand Ole Opry! 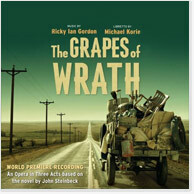 Composer Ricky Ian Gordon‘s score of the opera version of the Steinbeck classic “The Grapes of Wrath” includes harmonica and bass harmonica. I’ll be performing in February/March at Northwestern University. Find out more here. Using the well-loved sound of the pocket-sized instrument, he warps, reshapes, layers and loops live on stage to create something new yet familiar. His musical approach celebrates the harmonica's undeniable ability to connect with the hearts of an audience and extends the range of a solo performance to the orchestral. Rhythmic figures and drones from the at-times-otherworldly bass harmonica combine with its more common cousins, the diatonic harmonica (often called "blues harps") to create a live music experience informed by jazz, world music, modern classical and minimalism.